Hua Hin has a long history that predates its current name. In 1834, neighbouring Petchaburi province was hit by a severe drought and a group of farmers moved south and arrived at a village that had a white, sandy beach and some rocks. They settled and named the village Samor Riang, which means "row of anchors", after the fishing boats anchored off the beach, or "row of rocks", depending on which translation you take. In 1921, the Director of the State Railway, Prince Purachatra, built The Railway Hotel (now The Sofitel Central) and this, not surprisingly, coincided with the construction of railway line from Bangkok down south. 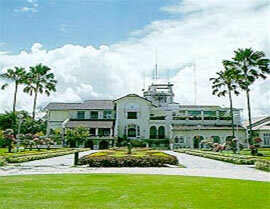 The Royal Hua Hin Golf Course was designed by a Scottish railway engineer during this era as well. The Royal connection, that Hua Hin still has to this day, started around the turn of the 20th century when a member of the Thai Royal Family, Prince Chakrabhongse, came to Hua Hin on a hunting trip with Russian nobility. He liked the town and returned to build the first Thai beach villa in Hua Hin. King Rama VI then built a summer retreat here and even later King Rama VII built yet another palace, naming it Klaikangwon - "far from worries". This Palace is still in use today by the Royal Family and indeed they spend most of their days there now in Hua Hin. Because of its Royal past and present and it's proximity to the capital, Hua Hin caught on with the elite of Bangkok and the town began to develop. Despite a lull in fortunes following World War II, Hua Hin has managed to recover and nowadays accommodates the facilities anyone would expect from an international holiday destination, whilst not losing the charm of a fishing village and it's rich Royal and Thai roots. The locals are extremely proud of their heritage and the town can offer the discerning visitor a real glimpse back into Thailand's history with its old colonial buildings, fishing heritage and quant timeless streets. Sofitel Central Hua Hin Resort has played an important role over the years in the development of Thailand's highly respected tourism sector. This legacy dates back almost 80 years to the romantic days of "Old Siam", when railways were the primary mode of transportation and wild elephants ruled the jungles. Late 19th Century - The first steamer, the Siam Orasumphol, sailed along the Chao Phraya River to the Gulf of Thailand entailing numerous stops before reaching the Malay Peninsula and eventually Singapore. 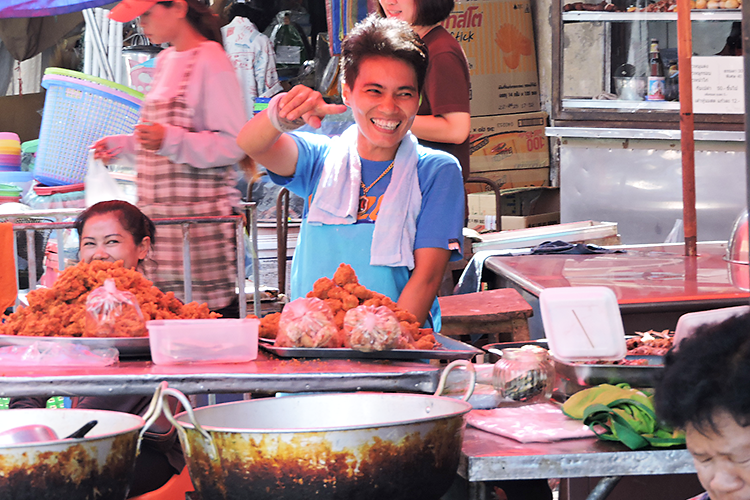 The route bypassed many small communities along the way including the area of Hua Hin. It provided the Royal Family with a level of comfort and convenience to travel. 1911 - Lam Hin was officially renamed Hua Hin, or 'stone head' in English. The railroad from Bangkok to Hua Hin was finished. It inspired members of the Royal Family, aristocrats, and Bangkok's elite to build bungalows here. The first person in the Thai Royal Family to recognise this unrivalled beauty was Prince Nares - the Minister of Public Works during the reign of HM King Rama V - who built a residence on the southern end of Lam Hin Village. The Saen Samran Royal Residence was built on beachfront land, and not far away, bungalows named Ban Plub Pa were also built as a residence of Prince Tewawongworapakorn and his family. 1916 - Other members of the Royal family built a complex of houses around the same time over the scenic group of rocks at the northern end of the village. Completion of the southern railway line connecting Siam to British Malaya, during the reigns of King Rama V and VI. Before international trains were running between Bangkok, Butterworth and Singapore, the State Railways organised food and accommodation services for passengers who had to travel longer than three days. It was common thing to break a journey for a night or two at Hua Hin where very basic and uncomfortable public accommodation was available near the station. 1919 - The Hat Yai-Pedang Besar train started its service. 1922 - Prince Purachatra: 'It is time to provide holiday makers with more comfort and convenience than before since it is very costly and inconvenient for people to have to prepare their own lodgings, facilities and servants themselves. Hua Hin is ideally suited to become a seaside resort town because of its serene atmosphere, and because the State Railway has its own land there'. To increase the standard of accommodation at Hua Hin the newly established hotel division of the Thai Royal State Railway decided to build the western style Railway Hotel. Prince Purachatra personally oversaw the construction of the new hotel. Mr. A Rigazai - the State Railways' Italian architect designed the original building as a luxurious two-story European style resort hotel made of brick and wood- as per a Royal command. The hotel was constructed on State Railways land while existing retail bungalows were moved a short distance away. King Rama VI commissioned road maintenance engineer A O Robins to build a golf course on land opposite the railway station, completing the original nine-hole, 3,000-yard Royal Hua-Hin Golf Course and tennis courts in time to welcome the first hotel guests on October 26, 1922. The hotel featured 14 bedrooms, a lobby lounge, bar, restaurant, billiards room, wine storeroom and large verandas costing a total of 128,366.75 baht, a staggering sum at the time. 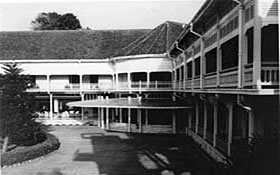 A verandah surrounded the building, cleverly designed to protect guests from the sun's heat and prevent rainwater from running back along the tiles. The building was remarkably similar in appearance to the Marukhatayawan Royal Residence in nearby Cha-am. A European manager was placed in charge of the hotel's fine dining continental restaurant. Even room service, a rare luxury at that time, was available. Gourmet European food was served in the restaurant on elegant western-style china. The silverware with the State Railways emblem-now on display in the lobby museum was made to order in Europe. Putra Intarmayura, whose father worked in the hotel gardens since it opened in 1923, recalled: 'At first the staff uniform was a khaki short sleeved shirt, khaki shorts and a sun helmet with the Garuda emblem. But this uniform changed to trousers instead of shorts after a manager had an excursion to Japan. 1923 - The hotel's official opening ceremony took place on January 1, 1923. It was the most luxurious and modern hotel in the region and an instant favourite among Thais and foreigners alike. 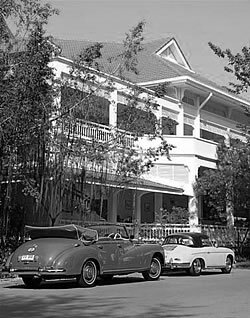 As the destination and the Hua Hin Railway Hotel grew in popularity, there soon arose a need for more guest rooms and bungalows; construction began on temporary lodges called Abbass House, built near the railway station. This soon proved inadequate and the State Railways added 19 additional small bungalows to the north and another 13 rooms using the original plans. 1939 - During World War II, stories of tranquil and peaceful Hua Hin travelled far and wide. After Thailand joined the war, the hotel was always full as many Bangkok-based foreigners and Thais fled Bangkok seeking refuge in Hua-Hin. 1948 - More bungalows were built north of Damnernkasem Road, and six years later bungalows A, B and C were pulled down to construct a new building. It was connected to the old one on land occupied by the Saen Samran Sukhaves Royal Residence which had been purchased from the Royal Family, the resulting three-story building now stands adjoining the Museum coffee corner. 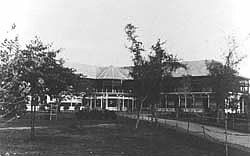 Thavorn Boonyaketu, the State Railway's architect, designed the new building, influenced by modern architecture. It had three restaurants, a bar downstairs, 23 rooms on the second and third floors, as well as a panoramic sea-view restaurant. A wide variety of modern construction materials were carefully selected, with the furniture and interior decoration designed with the guests's comfort and convenience in mind. Unfortunately the building was criticised however by those who said it did not harmonise well with the original structure. 1986 - In 1986 the State Railway of Thailand granted the Central Group of Hotels and Accor restoration rights to the grand hotel. The much-loved historical building was meticulously preserved, with a new swimming pool and Thai Pavilion also added and completed in December 1986. The hotel began refurbishing the old bungalows and added new gardens, lawns and fountains. Accor and the Central Hotels and Resorts relaunched the hotel as a Sofitel after two years of extensive refurbishment that emphasised the Edwardian architecture and colonial traditions. The Architects Association of Thailand gave the hotel an award for "outstanding conservation" in a category dedicated to preserving historic Thai buildings. 1988 - The hotel welcomed a new generation of guests under the name Hotel Sofitel Central Hua Hin in 1988. 1993 - A multi-function conference and banqueting hall catering for up to 300 guests was added, including a games room, library, night club, shops, a beauty salon, an elegant cocktail bar and the Railway Restaurant. The Central Village, formerly the old bungalow site and "Villa Wing"- used since the 1970's as a recreational area for families was also upgraded in harmony with the Colonial Wing. Shaded by many exotic varieties of plants, 22 villas were transformed from the original bungalows. They were beautifully decorated, each with two rooms, a living area, a pantry and a balcony. This area now includes 20 newly built villas and a central service area, Salathai Restaurant, swimming pool, large garden area, conference rooms, a charming open-air cocktail bar, and several attractively landscaped decorative fishponds. Sofitel Central Hua Hin Resort and the Central Village are spread over a total area 15.5 hectares (97 rai) of beautifully landscaped grounds and sculptured gardens. Additional facilities include the elegant Palm Pavilion Restaurant, an alfresco beach bar with terrace, three swimming pools for adults and three for children, two tennis courts, a giant chess board, putting greens, a maze, a fish pond, and the historical Museum Coffee & Tea Corner. The scale of the restoration and improvement of the two hotels reflects not only the needs of todays modern traveller, but also the building's rich history and heritage, standing as a testament amidst the beauty and tranquility of a bygone era. 1995 - The hotel's original bungalow D was then transformed into a Fitness Centre and Spa. The spa comprises two private treatment rooms with an en suite Jacuzzi that can accommodate two people comfortably . Two separate saunas are also connected to these rooms. In addition the spa offers three additional private aromatherapy treatment rooms, two of which are equipped for beauty treatments. Both the Fitness Centre and Spa command dramatic seaviews and are conveniently located next to the Railway Pool. 1998 - In January 1998 expansion of the property continued with the addition of the Garden Wing. Sixty rooms overlooking the newly designed gardens and swimming pool perfectly matched the original colonial architecture. A new swimming pool complex with children's pool, gigantic whirlpool and snack bar were added as well. The fitness room was eventually upgraded in October 1998 and turned into a Thai traditional massage area with four private massage rooms. 2000 - Renovation of the Railway Wing, converted twenty-two standard rooms into larger superior rooms and converted another twelve standard rooms into six junior suites. In addition seventeen deluxe rooms and two executive suites were renovated completing the entire Railway Wing upgrade. 2001 - Renovations on the hotel's Railway Wing were completed in July 2001, with all bathrooms being enlarged and spacious showers added. Most of the existing colonial furniture was retained, while new furniture was made from teakwood to blend harmoniously with the teak parquet flooring, high ceilings and antique fans. New fabrics (curtains, soft furnishings) were created from the finest cotton, and bedspreads were replaced with white and airy duvets. The Sofitel now comprises 207 rooms. The historical building was faithfully restored to preserve the valuable architecture, interior decoration and its old lobby in its original style. 2002 - The first phase of the Colonial Wing renovation was completed in October 2002. Forty superior rooms, twelve deluxe rooms and five executive suites were meticulously renovated to preserve the hotel's unique historical heritage. The forty superior rooms feature new bathroom, comfortable furnishings and refinished woodwork and have received a new closet. All balconies offer a panoramic sea view where guests can enjoy Hua Hin's cool ocean breezes. Twelve renovated deluxe rooms (including 4 superior rooms turned into the deluxe category) have enlarged bathrooms with separate shower stall and vintage style fittings. A sliding window panel between the bathroom and bedroom open to enhance the spacious interior. A new walk-in closet provides greater storage space. Balconies have received comfortable Thai-style daybeds in addition to the existing "lounge chairs". The five executive suites now offer a more spacious living room while the bedroom and the bathroom feature similar characteristics to the renovated deluxe rooms with an additional make up area. 2003 - The second phase of the Colonial Wing upgrade was undertaken during the summer of 2003 with the renovation of thirty two superior rooms, eight deluxe rooms and the hotel's famous Crystal Suite. With thanks to the management at the hotel and the Hua Hin Observer for the original text.